It was good to step out walking (it was now just before 10 a.m.). The trail starts at the West door and continues to the south of the Cathedral passing through the passage into the cloisters. We passed the mediaeval priory storehouses, the Pilgrim's school and Porter's lodge, the home in which Jane Austin died, and past Winchester College. 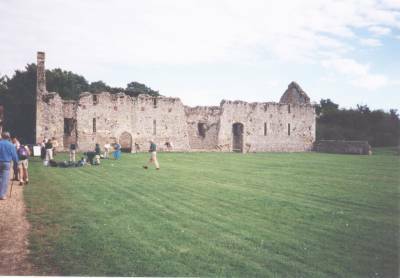 Not far away are the ruins of Wolvesey Castle, first built around 1130 by Bishop Henry de Blois. Wolvesey Castle was the residence of the Bishop of Winchester. It was during this stretch that I met Mrs. Walking Pole who explained she had been advised to use two to keep her body balanced and symmetrical, excellent, she explained, for hill climbing and steadying oneself going down hill. She then sped off. I didn't see her again. I was soon joined by Mr.Walking Pole (the husband) who was also enthusiastic about their use. We also discussed wine and I was instructed in the art of making wine more alcoholic. Then Mr. Walking Pole sped off too. I didn't see him again either! I particularly enjoyed the section by the side of the river Itchen. Before leaving the water's edge completely, just across the water meadows is The Hospital Of St. Cross. This was founded by the before mentioned Henry de Blois, who was also William The Conqueror's Grandson. The Hospital Of St. Cross is Britain's oldest charitable organisation and the Brothers still worship in it daily. The views around St. Catherine's Hill are quite spectacular, with rolling downlands. We strained for sight of skylarks. The chapel dedicated to St. Catherine is now in ruins. According to the excellent information pack produced by Hampshire County Council, Chapels dedicated to St Catherine are often on Hilltops, as her relics were reputed to be found on Mount Sinai. Our pilgrimish thoughts were interrupted by the unavoidable crossing of the M3. The track then went over Twyford Down and eventually to the War memorial where we had our 'coffee' break. This is a memorial to the troops stationed at Hazeley Down during the Second World War. Owslebury may mean 'Blackbirds Fort' although no fort is recorded in the area. The town was first recorded in 958 AD. Our entrance to Owslebury was greeted by friendly signs advertising pilgrims' lunches. Happy to oblige, a group of us marched off to 'The Ship' to be refreshed before moving on. We wandered into the mediaeval Church of St. Andrew with its examples of early English Architecture. There was something extremely exciting about re-tracing the steps of the pilgrims. It felt very right and somehow respectful to walk 'their' way. I enjoy walking across fields, being aware of the wide open spaces and incredible views and joyful that we have this gift. The next section involved just that, then proceeding downhill to cross Lower Baybridge Lane and eventually to the edge of Austin's Copse. Our afternoon stop was at Upham. The Church at Upham has a Thirteenth Century Arch and Eighteenth Century brick tower. Travelling on, the trail goes down to Winchester Road and then follows the line of the ancient Roman Road. There is a wet area nearby caused by springs which rise to feed ponds. Through the trees such a pond can be seen. It was at this time one of the pilgrims emerged from behind a tree admitting to having just checked on her son. (Never admit to owning a mobile phone when near water). Walking on along the line of the old earth road to Wintershill Farm, now we were on the 'homeward' stretch, on past Tangier Farm towards Brooklands Farm but turning up to the dismantled railway line to reach the roundabout. We then followed Station Road through the gatehouse to the Bishop's Palace. Although in ruins it is still impressive and is much bigger than anticipated. We were welcomed by Bishop's Waltham Parish Council who had kindly prepared tea and sandwiches and cake. There was also wine from a local firm. The letter of encouragement presented to all pilgrims made awesome reading far amongst the hundreds of pilgrims that had rested in the great house were Richard The Lionheart, Henry VIII and Elizabeth I. It really was a great day and Jean, Pat and I are hoping to complete the rest of the walk sometime next year.  Factual information taken from Hampshire County Council Pilgrims' Trail Information Pack containing information and maps. Price £2.99. Obtainable from Hampshire County Council Information Centre, Mottisfont Court, High Street, Winchester, Hampshire, S023 8ZB 0345 626424 (local rate) or 01962 870500.